Our salves are made with wildcrafted or locally grown herbs from our gardens and infused for 4-6 weeks in organic Olive Oil. The herbs are strained and then mixed with local beeswax, which offers a natural preservative. The salves are easy to apply, offering a soothing and healing effect to many skin irritations. Salves are available in three sizes. This comforting salve contains the leaves and stems of Comfrey, an herb reputed to help heal bruises, sprains, broken bones,and specifically helping with tissue regeneration. Locally grown Comfrey leaf infused in Organic Olive Oil and local beeswax. This All Purpose salve contains the herbs Plantain and Comfrey, reputed to soothe pain and inflammation for insect stings, rashes and bruises. This is our favorite for bee stings. This soothing salve contains Calendula flowers, Plantain leaves and Comfrey leaves and stems. These herbs help to soothe and heal skin irritations, diaper rashes, bruises and burns, bringing new life to damaged skin. Our one year old nephew has benefitted tremendously from this salve when diaper rashes are at their worst! This all natural salve contains the herbs Chickweed, Jewelweed, and Plantain, reputed to soothe, nourish and relieve itching, stinging and burning skin outbreaks. We have benefitted from this salve with successful results when applied at the first sign of a poison ivy rash. Wildcrafted or locally grown Chickweed, Jewelweed flowers and Plantain leaves infused in Organic Olive Oil, beeswax. 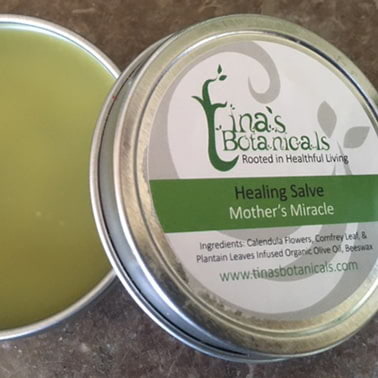 This amazing salve contains wildcrafted Calendula flowers, Lemon Balm, St. John`s Wort buds & flowers, Plantain leaves, and Comfrey leaves that have been infused for 4-6 weeks in organic olive oil. The beneficial qualities of these herbs are reputed to relieve pain, inflammation, and promote rapid healing.The plant magic in this salve works wonders on cold sores, damaged skin after surgery and from radiation treatments, leaving the skin soothed and nourished.